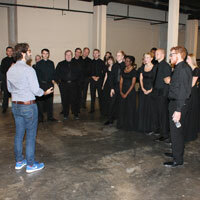 Josh Groban speaks with the Webster Chamber Singers before their backing performance for his concert at the Peabody Opera House in St. Louis. When Josh Groban comes to town, thousands clamor to hear him sing. The lucky few get to sing with him. The multiplatinum-selling star played to a sold-out crowd Oct. 19 at Peabody Opera House in St. Louis, where he was joined on stage by the Webster University Chamber Singers. The St. Louis Post-Dispatch review by Daniel Durcholz praised the concert and described the Webster student singers providing "powerful backing" on "Anthem," from the musical "Chess," and on "You'll Never Walk Alone," from "Carousel." Local Fox affiliate Fox2 also covered the students' appearance on multiple news broadcasts that day. The Chamber Singers are directed by Trent Patterson, assistant professor of music, who guides a student choral group that has received several honors over the past few years. The Webster Chamber Singers backed Josh Groban on "Anthem" and "You'll Never Walk Alone." This year, the Chamber Singers were selected to perform a new work during the reopening of the Pulitzer art museum. They also were named semifinalist in the college/university chorus division of The American Prize, a national non-profit multi-category competition in the performing arts.